Located in northern Virginia, Herndon occupies 4.25 square miles. The town is situated between Dulles International Airport and the Town of Reston. 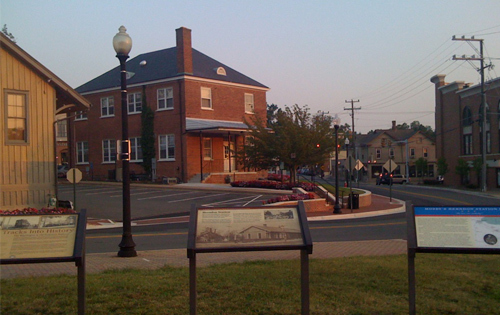 Located entirely within Hardiness Zone 7a, the Town of Herndon has eleven neighborhood parks and trails. With such beautiful trails and greenery, Herndon has established a tree ordinance to protect its trees and provide guidelines for their removal. Following is an excerpt from www.treeremovalpermit.com/virginia/herndon-ordinance-permit-arborist/, which explains the Herndon, Va tree removal permitting process and requirements in detail. Private, commercial, and multi-family property owners in the Town of Herndon must acquire a tree removal permit for the lawful removal of protected trees within a Resource Protection Area (RPA). In the absence of an RPA, property owners within the Town of Herndon ARE NOT required to attain a tree removal permit or notify the Town of the removal of trees on their property. The following offers guidance for lawful tree removal and how to handle fallen trees. Troubled, Diseased, Dead or Dying Trees – These trees (once identified by a property owner) should be addressed as quickly as possible. The Town of Herndon’s Community Forester may require (by official notification) that a property owner take action on such a tree. Especially in cases where the tree poses an eminent threat to structures, people, and its surrounding ecosystem. Typically the property owner is given 15 days to comply with the notification. Noncompliance is considered unlawful, and after such time has elapsed, the Town shall have the authority to remove such tree and charge the cost of that removal to the owner. Protected Tree(s) on Private Property – Trees found along streams, watershed, easements, or other Resource Protection Areas (RPA) will require submission of an RPA permit application before any trimming, pruning, or removal activities may be performed. For landscape improvement or construction, that is located on land that includes a Resource Protection Area, an RPA permit must be acquired. Fairfax County’s Land Development Services – Customer and Technical Support Center should be contacted at (703) 222-0801 (option 2) for permitting and land disturbance support. When in doubt, the Town’s Community Forester can be contacted to evaluate the location of the tree and offer further guidance. Tree (on Town Property) Falls Onto Private Property – In this case, immediately notify the Community Forestry Department of the Town of Herndon at (703) 787-7380. A crew will be dispatched to remove the tree (in most cases, they will remove the tree in its entirety). If the fallen tree caused physical damage to structures, inflicted bodily harm, or death on any person, file a claim using an e-claim form or mail a claim form to the Town Attorney (within 6 months of the occurrence). Pictures should be taken of the damages along with detailed documentation. Tree (on Private Property) Falls Onto Town Property – The property owner is responsible for the portion of the tree up to the property line. After having notified the Community Forestry Department, they will dispatch a crew to remove the portion of the tree on Town property up to the private property line. The Town will document any physical damage to structures, bodily harm, or death caused by the tree’s falling. Subsequently, the Town Attorney may file a claim against the property owner’s insurance policy. Tree (on Private Property) Falls Onto Adjacent Private Property – The property owners are responsible for the portion of the tree that is on their respective property. Each should contact their homeowner’s insurance providers. From where the tree(s) originated is irrelevant. However, if the property owner was previously notified of the tree posing an immediate threat, that property owner may be responsible for any and all resulting damages and injuries.